Part of our new collection this Christmas season comes our Goodwill bejewelled floral reindeer display. Beautiful handmade with floral lace body with a shimmer detail, tall glitter antlers flux fur with crystal detail around the neck, Beautiful long brass chain from the front mouth of the deer to the back top part of the deer with a stunning large Crystal. 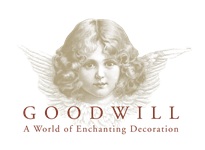 Our Goodwill display will dress any home decor this Christmas season Exclusive early delivery before the launch date in August, Available for shipment now.